Indignation does not justify spitefulness. I couldn’t agree with her more. So although I do not feel shame after reading this Meme, I do feel the need to speak (type) on it. Here are just some of the problems with this Meme. 1. The Christian doctrine teaches that “God” forgives us for our sin, even those which are natural (like lust, and anger) and he also forgives us for being inquisitive enough to question what Man (the author of religion) has told us. 2. The person who wrote the caption in this Meme (and those who agree with it) did not personally know Mr. Nelson, nor Mr. Jackson, and therefore all of their claims are mere speculation. As a result of being completely ignorant of these gentlemen personally, they also don’t know what is in the hearts of each individual. Something that many believers use to justify their willful disobedience of their God’s laws. So, if those disobedient Christians are safe from damnation because of “grace and mercy” then why aren’t these two men? It is as if your sin isn’t considered as damning as theirs. Which reminds me of the quote “Sin, is sin.” as to say that it is all considered of the same level of severity. Which is odd because logically a torturer should be considered more harmful than a person who believed in a different religion. 3. Anyone who condemns these men (by making, posting, or agreeing with a Meme like this) in their heart has already condemned their fellow Man. And has failed to forgive others, as God has forgiven them. So, by all definitions you would be a hypocrite and a condemning person who failed to show the same mercy and forgiveness that you say is shown to you. If you’re not perfect, then why were either of those two supposed to be? 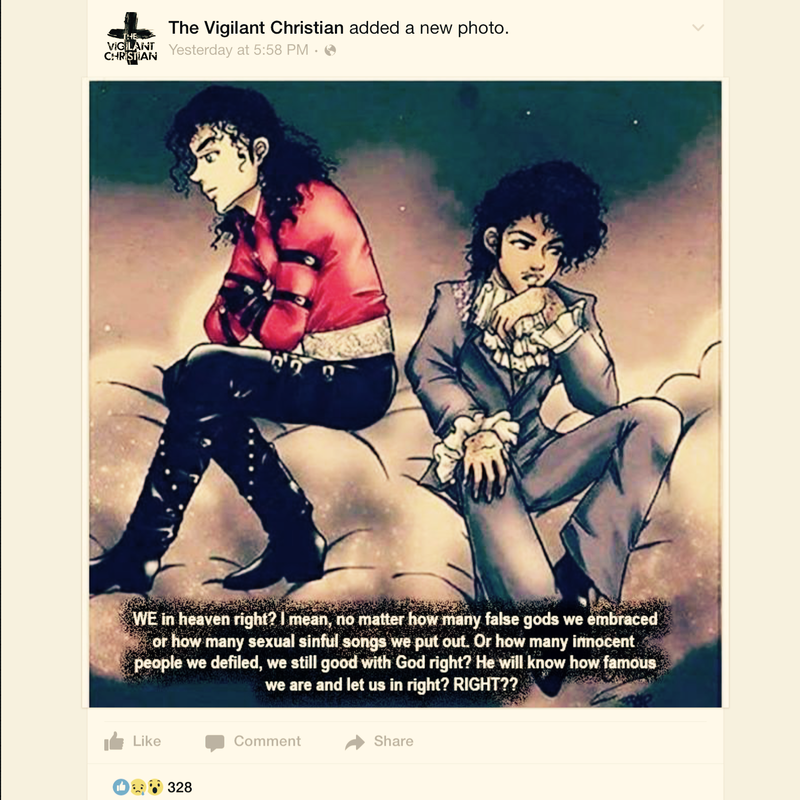 This entry was posted in Celebrity Hecklers, Fame, Hypocrisy, Jesus, Misinformation, Misinterpretations, Nationally Publicized Tragedies, Presumptuous Assessments, Religion, Religious Tolerance, Selective Empathy and tagged As We Forgive Those, Michael Jackson, Prince, The Vigilant Christian on April 23, 2016 by BThePunisher. Stay for as long as you'd like.